It’s November, and we’re killing fruit flies. Where do they come from? Usually, I can blame the over-ripe bananas that I bring home from the second-rate fruit store, but not this time. I think they came from the pumpkin. All right, I confess. Some Jews have Christmas envy. Me, I have Halloween envy. When it gets cool and the leaves change color, I want cornstalks on my doorstep, gourds on the table, spiderwebs on my bushes, trick-or-treaters at my door. Two weeks ago, on a brilliant fall day, we went apple picking. The leaves were spectacular, in shades of chocolate, wine, dun, caramel. We drove south for an hour, got lost, consulted the GPS, did what it said, made some illegal turns, found the farm. The crowds were huge; we had to park in a lot across the road. Dutifully, we stood in line to pay heavily for the privilege of picking our own apples, at which point we were told that, due to global warming, there were no more apples, they had all ripened two weeks early. So that the visit wasn’t a total loss, the smaller kids picked out pumpkins. (Hey, they’re seasonal, okay?) And when we brought those pumpkins home, like every other five-year-old across America, Jude wanted a face carved into his. I uttered the lame explanations for why orthodox Jews don’t celebrate Halloween, and then I caved. You say no to the cute five year old. Two triangles for eyes, a nose, a jagged smile. Classic. It took me about twenty minutes. (Two years of mandatory graduate-level sculpture classes, baby.) What’s the big deal, anyway? It’s a pumpkin, not a pagan god. Two days later, the fruit flies appeared. At first, there were just a few. We ignored them. When it’s warm, there are often one or two that the kids inadvertently let in, lagging around the kitchen. Usually, they just die. But this time, by the end of the second day, a swarm of tiny critters was hovering around the jack-o’-lantern. I must admit, it looked particularly fiendish. Gray fuzzy mold had taken over the interior, and was now scowling malevolently at us from triangular eyes. 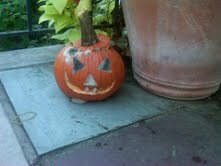 Despite Jude’s outraged howls of protest, the pumpkin moved outside. Day after day, we have watched the thing collapse, settling in on itself like a demonic orange troll. Day after day, the fruit flies have increased their numbers, mysteriously avoiding strategically placed coils of flypaper. Coincidence? Biblical scourge? Or is it something else? I must point out, the flies do provide opportunities for family bonding. Instead of watching TV or playing Wii, we vie for a turn with the fly swatter. We gather round and cheer each others’ conquests. That counts for something, right? In my experience, with diligence, we’ll have routed them within a week. When it gets cold, raccoons will steal what is left of the pumpkin, the kids will go back to texting and embarrassing themselves on Facebook. But we’ll always have the memories. And this photograph.